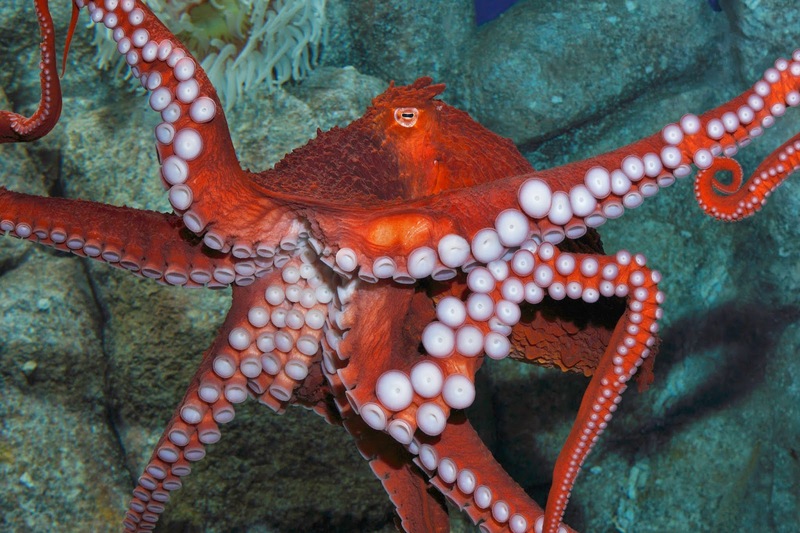 I fell in love for the first time at age ten when I met a giant Pacific octopus in the Monterey Bay Aquarium. For two hours I watched the slow dance of suckers across the glass, the deep billowing breaths, and most of all the sharp bright eyes that watched me back. When we got home to LA, I promptly sold the expensive American Girl doll that I had saved up forever to buy and began looking in secondhand catalogs for a saltwater aquarium. My dad helped me set it up, our local fish store sold me inhabitants, and at school I became The Girl With The Pet Octopus. Ten years later, my passion undimmed, I embarked on a cephalopod-themed Ph.D. at Hopkins Marine Station. Literally next door to the Aquarium. How excited am I that Aquarium's latest exhibit is all cephalopods? "Tentacles" opened today, featuring more GPOs, more cuttlefish, plus tropical octopuses and deep-sea octopuses and the most adorable little bobtail squid and dwarf cuttlefish. And how thrilled was I to be asked to write about it for KQED? It was "almost supernatural fortune," to borrow the words of artist Nemo Gould. He was "approached and asked to do a strange and specific thing that I already wanted to do"--namely, create cephalopod sculptures to complement the exhibit's live displays. You can read more about them in my KQED article, or just visit them in situ. While researching the story I gathered pages and pages of gripping material; I was totally sucked in. (Sorry!) Some of it went to KQED and some to Squid A Day. But I couldn't fit in either of those posts all the fun stuff I learned about exhibit design. Live animals are the stars, but as it turns out they have quite the supporting cast. When I walked into the Aquarium's workshop, the Eurythmics' "Sweet Dreams" was rocking out over the radio. Maybe half a dozen enormous poster printers were patiently churning out interpretative signs and wallpaper at a much, much slower beat. Most fabrication of physical materials is done in-house, which means the Aquarium employs quite a few artists and engineers. In addition to designing and printing flat stuff, they build touchable displays--handles and buttons and knobs to grab and turn and push. For "Tentacles" they put together a demo of jet propulsion. Visitors can pump a 3D-printed squid body through a tank, its jets visualized by bubbles shooting from its siphon. This strikes me as an especially useful display, given that the really active swimmers among squid are disqualified from live display by that very feature. After visiting the shop, I was taken to see the programmers, busily building with keystrokes rather than lathes. My host turned on a row of monitors to play looped footage of a school of bigfin reef squid while we talked. Near the end of the conversation, he pointed out something that had completely escaped my notice: the "school" comprised copies of a single individual, edited and staggered in time so any given screenshot would show each copy in a different pose. This wasn't the original plan, but the aquarists, understandably nervous about stressing their display animals, kept the shooting time to a minimum and they only ended up with good footage of one animal. They made it work. Copying and splicing squid together, though, is less of a challenge than teaching computers to recognize faces. How do you deal with glasses? Mustaches? The coders had to pull it off, though, in order to create a "facial recognition chromatophore display." When you gaze into this screen, it shows your face covered in chromatophores, the skin cells cephalopods use to change colors. And the chromatophores match your facial expression. For example, "look threatened, get blue rings on your face." How do you look threatened, I asked. My host demonstrated by baring his teeth. I've never gone to the Aquarium to listen to the music. I don't think I could remember a single tune I've heard there. But every gallery has its own score, whether or not you notice it, subtly influencing your experience. The music track for "Tentacles" was inspired by "Peter and the Wolf"; the exhibit designers wanted an instrument for each animal. Meetings were held, notes were taken, and then an Aquarium delegate traveled to LA and worked with a producer to write the score. Finally, they hired musicians to perform it. The whole process took 4-5 months, I'm told, and in retrospect I wish I had asked a hundred more questions. Are the musicians hobbyists, students, professionals? Can people make a living doing this? Does the Aquarium ever play parts of the score for test audiences before going live? Which instrument was chosen for each animal, and why? People come to the Aquarium to see cephalopods and fish and jellies and otters. No one comes to see humans. Still, Aquarium staff can be an integral part of an exhibit, fielding questions and offering a more engaging presence than an interpretive sign. In "Tentacles," a real live person will do a presentation about cephalopod intelligence a couple of times a day. Cephalopods, especially octopuses, are widely known as the brains of the invertebrate world. I've found that "Aren't they really smart?" comes a close second to "Aren't they really tasty?" in frequency of questions from the public about cephalopods. Apparently the exhibit team talked about this a lot, and decided to avoid using the word "intelligence" in favor of talking about "adaptation." I think this was because scientists don't really have a satisfactory definition of intelligence. Nevertheless, at least three cephalopod scientists feel comfortable enough with the word to have published Octopus: The Ocean's Intelligent Invertebrate. Besides, why be so cautious with terminology while shrugging off other biological inaccuracies? Real squid jets do not contain bubbles. Chromatophore patterns do not translate to human expressions. But a real squid jet is invisible in the surrounding water, and there's little of interest in seeing a foreign language, that may not even be a true language, in which you don't recognize a single word. Concessions are made in the name of practicality and accessibility. I thought at one point I might like to work in exhibit design, but it seems rather daunting now that I know a bit more. I feel lucky that I get to simply write about all the hard work that goes into something like "Tentacles." I wasn't able to attend the opening this weekend; I may not make it down until the end of the month. When I do, you'll probably find me in the GPO Grotto, gazing at my first love. I've been very much enjoying your articles about the exhibit, and I can't wait to get to the Aquarium and see it for myself! I love your story about how you came to be the Cephalopodiatrist! Thanks, Lisa! I had the odd realization that I had written the story at least a dozen times in school and fellowship applications, but had never actually shared it with a wider audience. Danna, great article! If you'd ever like to ask "the 100 questions" about the musical score, give me a buzz, I'm the composer of the exhibit. How cool! I will be listening carefully when I visit, and afterwards I would love to get in touch and learn more about the process. Thank you!